Photographer Ron Elkind sent us some cool airplane photos taken at Nellis Air Force Base, Nevada. 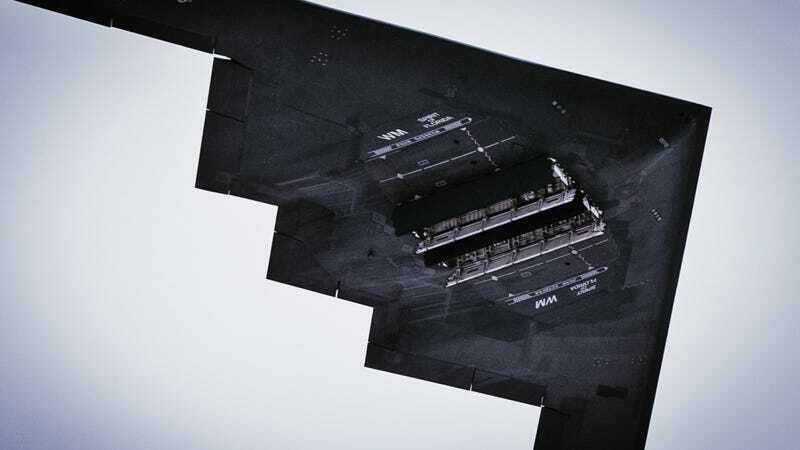 Like this is the B-2 Spirit of Florida with its weapons bays open—mouths of destruction that can vomit anything from bunker busters to nuclear nombs. Or this beautiful F-16 shot. It feels like a mirror image, but they are two USAF F-16s flying in formation, part of the Thunderbirds air demonstrations squadron. Here's an extra shot of the B-2. And some US Navy Blue Angels for good measure. Ron Elkind is an amateur photographer who studied fine art photography for seven years after back problems halted his 40-year sailing career. He's fascinated by aircraft and flew out to Nellis AFB to shoot these images back in 2010 and 2011.